Have you ever watched a war film and wondered, “What’s a Foxtrot? Who is Charlie? Did someone say Tango?” These unusual words belong to a powerful code language known as the Military Alphabet. Servicemen and women use this language to improve clarity of communication, and sometimes as a form of slang. 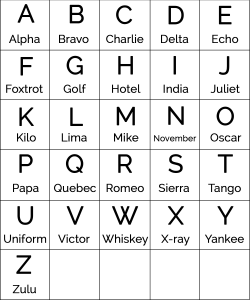 The military alphabet, officially the International Radiotelephony Spelling Alphabet, consists of 26 code words. Each represents one letter of the English alphabet. For instance, “Alpha” means “A,” “Bravo” means B, and so on. Multiple code words often are combined to form words or expressions. For example, to say “dog,” one would say “Delta-Oscar-Golf.” None of the 26 code words sound alike, so there is no doubt what is said when spelling this way. This page will help you make sense of this distinct language. We include the entire Military Alphabet below, along with pronunciation info and spelling. For those who want to learn this code, we provide a useful memorization video to help you do that. You can also purchase a Military Alphabet poster as a visual aid, or as a decoration. Whether you are pursuing a career in the military or aviation, looking for some thematic decorations, or just have a curiosity, scroll down for a comprehensive rundown of everything you need to know about the Military Alphabet. Want a birds eye view of what the military alphabet looks like and how to pronounce everything? Use the chart below. Flash Cards – Don’t reinvent the wheel. Take 26 flashcards, write the letter on one side, and the corresponding Military Alphabet term on the other. If you want to learn Prowords, Military slang, or other terms, make cards for those phrases and their definitions as well. Flash cards do not take very long make, and will remain a helpful reference as you learn. Write it out – Try to write out the Military Alphabet from memory. Do this at least once a day, and try to get as many of the letters as you can without looking until you can rifle them off without thinking. Ask a friend to test you – Some people aren’t visual learners. Don’t just stare at the Military Alphabet forever; ask a friend or family member to test your knowledge and keep track of the letter you have trouble with. Record yourself and play it back – Make an audio recording on your phone or computer, and listen to yourself saying the Military Alphabet back to yourself. After a while, these terms will become second nature to you. Think about the military alphabet as you read and write normally – Thinking about the military alphabet as you go about your daily life will help you get more comfortable with it. Think about how to spell random everyday words the military way. This is a great way to increase your familiarity and comfort with these terms. Read the alphabet before you go to sleep – if you struggle with memorization, try spending some time reading the Military Alphabet before you go to sleep. A proven method commonly used by actors, lawyers, musicians, and others, this will help your brain process new information better. Do it backwards, change the order, focus on problem words – You want the Military Alphabet to become second nature to you. Therefore, be sure to use different ordering, methods, and techniques to learn this alphabet. You need to be comfortable spelling out unfamiliar codes and terms under duress with this new terminology, so keep that in mind during the learning process. Over the first half of the 20th century, several different spelling alphabets came in and out of use. The most important of these were the CCIR alphabet used for telegraphs starting in 1927, and the “Able Baker” alphabet used by the U.S. military during WWII. After the war, it was determined that this wartime alphabet included words and pronunciations particular to American English, which hindered communication between NATO allies. So then, in 1957, NATO and the US introduced a common system, now known as the NATO Military Alphabet, which still remains in use. The earliest versions of the military alphabet came into use during the early twentieth century. AM radio technology enabled pilots to coordinate with ground control, but poor signal and radio interference caused frequent errors. To solve this problem, flight associations started using code words to represent easily confused letters. This new terminology helped them communicate both more efficiently and covertly. During WWI, the British Royal Airforce introduced the first complete spelling alphabet, the RAF radio alphabet. Later, in 1927, the International Telegraph Union (ITU) developed a spelling alphabet for telegram communication. Over time, this system grew in popularity. By the start of WWII, most commercial airlines around the globe were using the ITU code words. The next major evolution took place in 1941, around the start of the Second World War. At this time, the US introduced a standard spelling language across all branches of the armed forces. The Joint Army / Navy Phonetic Alphabet, also known as the “Able Baker Charlie” alphabet, can be heard in movies and TV shows dating from the 1950s. It has even made its way into modern cinematic depictions of WWII, such as Saving Private Ryan. In 1957, the U.S. armed forces and NATO adopted a common alphabet known as the International Radiotelephony Spelling Alphabet (IRSA), or the NATO Phonetic Alphabet for short. The ICAO (International Civil Aviation Authority) developed this system after years of careful research and testing. Critically, the ICAO tested each code word in many common dialects. As a result, the IRSA has stood the test of time as an international standard. Many refer to the military alphabet as a phonetic alphabet. This is technically not accurate. Unlike, say, the International Phonetic Alphabet, which indicates intonation, syllables, and other features of speech, the Military Alphabet does not actually indicate its own phonetics. The Military Alphabet is known as a “spelling alphabet,” used to spell out words and communicate clearly. In other words, while phonetic alphabets use symbols to describe the details and nuances of language, the Military Alphabet is simply for oral communication. The Military Alphabet flattens language so all users can communicate efficiently. Otherwise, regional accents, dialects, and unconventional voice patterns would lead to miscommunications. But no matter how you speak, “Foxtrot” and “Echo” do not sound the same, which is why the Military Alphabet exists. BOHICA – Bend Over, Here it Comes Again. Vietnam-era slang that has endured. FUBAR – Fucked Up Beyond All Recognition. You may have noticed that many english letters sound similar. For example, it’s common to mistake “B” for a “P,” “C” for “E,” and so on. For most of us, this sort of error might cause a mislabeled package shipment or a misspelled dinner invitation. However, for a soldier or fighter pilot, a misheard command or radio signal can mean life or death. Therefore, radio operators in the armed services often rely on the military alphabet when sending codes or relaying important information. This ensures clear communication, regardless of background noise or radio interference. To discover more expressions, check out our list of military slang. The Military Alphabet is the foundational piece of the military’s codified communication procedure. This procedure helps regulate communication over the radio and other communication platforms used by the military. This system helps soldiers by restricting the flow of information, emphasizing clarity, and instituting norms for orders, updates, and important information. There are three guiding principles for Military Communication: Accuracy, Brevity, and Clarity. Whether you are communicating via radio, in person, or on any other platform, all tactical communication should adhere to these criteria. Keep tactical messages short and to the point, and limit communication to essential items. Keep messages under 30 seconds as a rule. This way you will be easily understood, even under duress and chaos. Radio communication is the most important way soldiers communicate during operations and conflict, and therefore has the most codified structure. This section will provide an overview of what you need to know about radio communication. Keep in mind, whenever you spell out words or codes on the alphabet, you will use the Military Alphabet. The most famous cultural usage of call signs takes place in the film Top Gun. “Maverick,” “Iceman,” and “Viper” are all call signs you are likely familiar with because of those iconic characters. In reality, though, you would want your call sign to be less tied to your personal identity. The idea is for U.S. soldiers to be able to identify each other and communicate without revealing too much, even if messages are intercepted. Be sure to always use the call sign of the unit you are calling at the beginning of your message. While fairly simple, radio checks are important to make sure communication lines are in tact. Radio checks are periodic check-ins that confirm that other Call Signs are effectively hearing your messages. Be sure to conduct regular radio checks, especially before and after operations. Below is a list of important procedural words, known as “Prowords,” that play important roles in radio communication. You will need to know what these mean, and how they stand-in for and abbreviate longer messages. Important note: avoid using the word repeat. Transmissions are often interrupted or broken up, so it becomes unclear whether you are repeating a transmission or requesting a transmission be repeated. Break Establishes that the current message will continue in a separate transmission. “Break” is inserted to keep transmissions short. Correction Establishes that an error has been made in the transmission. A revised transmission will follow this Proword. Execute/Immediate Execute Establishes the action/order within this message is to be carried out upon receipt of this message. Out This Proword is the last word of all transmission sequences, and establishes the end of the conversation. Can only be spoken by the person who initiated the transmission. Typically, radio messages will feature at least one of these Prowords. These four are particularly important, because they determine the nature of the message. Roger and Negative establish agreement or disagreement at the beginning of a message. Likewise, Break and Over will determine whether a particular transmission is a complete message or not. The “Military Alphabet” is not just for the armed forces. As we explain further in the History section of this page, this alphabet was actually developed by the International Civilian Aviation Organization (ICAO) as a set of terms that would be mutually comprehensible across the international community. This language was designed to minimize miscommunication, and is used in many different non-military settings where codes and clarity are key. Flight coordinates and passenger names are communicated using the Military Alphabet. Pilots rely on the Automatic Terminal Information Service (ATIS), which provides a continuous broadcast of weather information, runway logistics, and other vital information. Updates are assigned different Military Alphabet letters so pilots know how current its updates are. ATIS also features a lot of Military letters and numbers to communicate logistical data. The military alphabet is used to make up Squawk Codes, officially known as Aircraft Transponder Codes, which is used to distinguish flights and aircrafts by air traffic control. Aviators often use many of the same prowords and slang terms as the military, and conduct radio communication using similar norms. For example, Roger/Negative/Over/Break are just as foundational to aircraft communication as military radio communication. Some airlines replace Delta (code for “d”) with an alternative word. This is to avoid confusion with Delta Airlines. This is sometimes known as the Aviation Alphabet. Banks utilize the Military Alphabet to communicate security codes and to verify customer information. Banks, traders and financial institutions often use the military alphabet when trading or ordering large transactions.